I just read the final chapters of what will be known as one of the first and most succesful epics of the 21th century. I’m talking, of course, about the Harry Potter Saga. It all started years ago. It was a hot, dry summer night. My parents were out for two weeks on vacation and I had the house to myself. I was bored. Really bored. Really, awfully bored. I had already read all the books in my room, and then some. So I went through the shelves in the rest of the house and came to find a small, thin book titled Harry Potter and the Philosopher Stone between the books for the English course my mother was taking back then. It was their reading material. And I thought ‘being a children book, it won’t be too hard’. I thought it would last me at least a little more than the other books I’d read that summer… you know, foreign language and that. Next morning, I had already gone through it, and went looking for more. I think four books had been released and the fifth one was coming at the end of the summer. They were taken care of in the following days, which sort of earned me a couple more nerd points between my friends: there were a few days of mocking –as the Pottermania was high on grrl-written fan-fiction–, and not having any more installments to read, I sort of forgot about it. Yea, I downloaded went to see the movies, and took part in the ocassional conversation in the matter. It’s curious how chicks seemed to be drawed to the books and hold incredibly strong opinions on the characters. I enjoyed all that. Last summer the fifth movie launched and I was newly tempted. I couldn’t help but preorder the last book on Amazon and yes, I will have the paperback boxset with that, thanks. Received then, put them on a shelf and forgot about it for six more months. Then came a night. I was bored. Really bored, Really awfully bored. 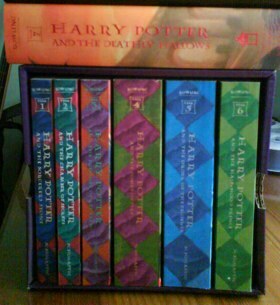 I picked up the fifth book –Order of the Phoenix– and got busy. I don’t have that much free time now, and they are quite longer than the first ones, so it’s been a month of reading. Of delightful reading, one could say. It’s been a month of page turning, a month of not much sleeping, and a month of being late to work. I had not been that hooked to a story since I was… I don’t know, maybe eleven or twelve. I had nearly forgotten of the guilty pleasure of being groggy all day because of the late night reading, just hoping to get home again and keep going at it. It’s been thrilling to drink each and every one of nearly 2000 pages of the most charming fantasy, which is the careful blend of love, death, work, play, magic and daily life of a long list of characters that you come to care of. You know, that thing you get from just a few, precious sagas. The ones that leave you yearning for more. The ones that get you on a bad mood as you see the remaining pages of the last book shrinking every day. The ones about which you can only say, with deep regret, ‘well, that’s it’ as you read the final paragraph. The ones that will never leave you satisfied, though you know it’s better that they end now than to be milked for money until they turn into crap. Anyway. I hope it wears away in a few days, or the next book I pick up will have it really hard not to look uninteresting. Recién terminado he el primer libro del 2008. Me ha llevado mi tiempo darme cuenta de la falta que me ha hecho una lámpara de lectura junto a la cama durante los últimos años. Después de Pattern Recognition, y en lo que ya se ha llamado la trilogía de Blue Ant, tenemos Spook Country, que nuevamente vuelve a tener lugar en la actualidad o no muy lejos de ella. Como bien señaló JJMerelo no deja de ser la ya habitual búsqueda, que presenciaremos a través de los diversos personajes que se nos presentan. En este caso tenemos un adicto a los tranquilizantes cautivo de un agente del gobierno que lo utiliza como intérprete cautivo en su persecución del trasto; un joven representante de una dinastía familiar cuyo negocio es el espionaje, y a Hollis Henry, a quien podríamos señalar como la protagonista principal. El amigo William, con su particular estilo nos identifica con ella haciendo que siempre vaya un paso por detrás del resto de los personajes, sin saber lo que pasará a continuación pese a disponer de medios casi ilimitados proporcionados por Hubertus Bigend, el magnate de la publicidad que ya conocimos en el libro anterior. Sobre el argumento, no diré mucho. En cierto modo, se vuelven a explorar algunas de las ideas de la trilogía del Puente: realidad aumentada, deidades vudú, un lenguaje que solo puede comprender un personaje -los puntos nodales, el volapuk-… El geoposicionamiento cobrará también una importancia crítica para la historia. Para el resto del argumento, y todo lo que rodea y comprende la novela de Gibson, lo mejor que podeis hacer es ir a Node, que me ha sorprendido tanto como el libro en sí. Compartiendo nombre con la revista ficticia en la que trabaja la protagonista -literalmente, una versión europea de Wired-, Node es un tumblelog que contiene un análisis capítulo por capítulo, anotado e hiperenlazado, y que es una de esas ideas que hubiera querido tener yo. Y ahora, a por el próximo libro.